I spent Sunday afternoon in the trails doing work. A huge birch tree fell from our neighbors backyard into the trails area last year and I finally got around to cutting it up. Free bonfire wood! I cleared more brush and raked a ton of leaves extending the new path further into the woods. 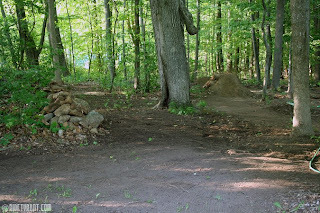 I cleaned up the entrance to the trails, stacking a bunch of rocks into a make shift stone wall and filling in some low spots. The highlight of the day was when I was carrying a 80-100lb log down to the 2nd lander and I spotted a 2' snake a few feet from me. I dropped the log and ran like hell back up the hill like a little girl. After I was a safe distance I decided some photos of the snake would probably be cool...from a distance of course...with a zoom lens. All in all it was a pretty productive day even though I didn't get any digging done. I'm going to be at the trails tomorrow from 6-9, anybody down to dig?? ?